At long last, the Power Rangers movie finally hit theaters over the weekend and, despite the majority of critics not loving the movie, it really seemed to delight fans. It also did decent business at the box office, which pretty much ensures that Power Rangers 2 will happen. Longtime fans of the franchise will surely be excited that the sequel will include the Green Ranger. But the character could wind up being played by a female, if the cast gets their way. Warning: this article contains minor spoilers for Power Rangers. Those who saw Power Rangers over the weekend and stayed after the credits know that the Green Ranger is very likely going to be making an appearance in the sequel. This was seemingly confirmed by the Power Rangers Twitter account when they posted a motion poster that had a Green Ranger helmet on display. Speaking with The Hollywood Reporter, Darce Montgomery, who plays the Red Ranger in this new movie, revealed that he and other members of the cast hope that the Green Ranger is played by a female in Power Rangers 2. Here is what he had to say about it. "A lot of the cast and I have discussed that we think it should be a girl. It makes it even: three girls, three boys. It's left blank. It's a cliff-hanger. Whoever you're going to drop into that position, whether it's a girl, it's inevitably going to create drama. It'll be interesting to drop that drama into it and see how we all relate to it and work with it,"
The math certainly checks out in terms of making the team balanced. But, fans of the Mighty Morphin Power Rangers TV show know that the Green Ranger was played by a guy. The character in the show was named Tommy Oliver and was played by Jason David Frank. Tommy appeared in several of the Power Rangers TV series over the years and would appear as other Rangers, such as the White Ranger, Red Ranger and the Black Ranger. Tommy Oliver isn't actually seen in this new Power Rangers movie, but he (or possibly she) is mentioned in the post-credits scene. In which, a teacher is doing roll call and a student by the name of Tommy Oliver is nowhere to be found, but a green jacket is sitting in a vacant detention chair. 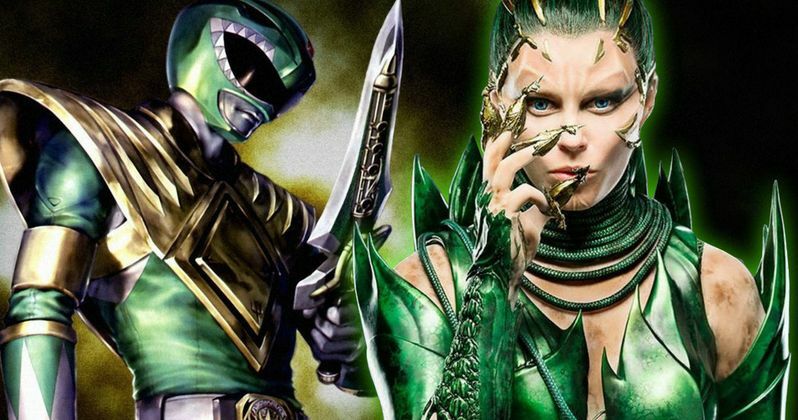 Director Dean Israelite didn't comment on the Green Ranger being played by a female but he makes it clear, if you read between the lines, that the Green Ranger will be a factor moving forward. "There's a post-credits scene, so people should stay. It teased up the direction of what the next movie could be. For people that know the brand, it's super exciting. There are so many ideas we're kicking around in the direction of where the film leads you." Before the Power Rangers debuted, many believed that Rita Repulsa was actually the Green Ranger. No matter what form or gender the Green Ranger winds up being, fans can look forward to seeing the character in Power Rangers 2 and beyond. Lionsgate has lofty plans for the franchise, having planned out a six-movie arc before this first movie even hit theaters. The new Power Rangers movie wound up losing to Beauty and the Beast at the box office, but it still pulled in $40.5 million domestically. In total, the movie has made $59 million and everything, at least so far, indicates that Lionsgate is happy and will probably want to move forward with the sequel. It would be a pretty big bummer for those who want to see the Green Ranger on the big screen get that tease, only to never see it come to fruition.